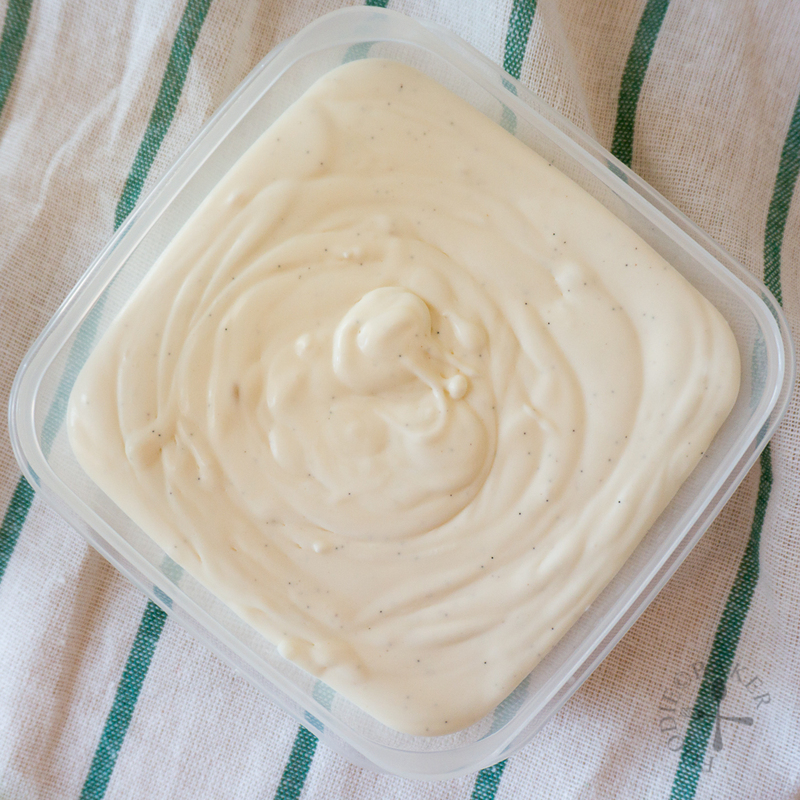 Do you love homemade vanilla ice cream but can’t stand the thought of cooking the custard or freezing the troublesome ice cream machine component? Fret not! 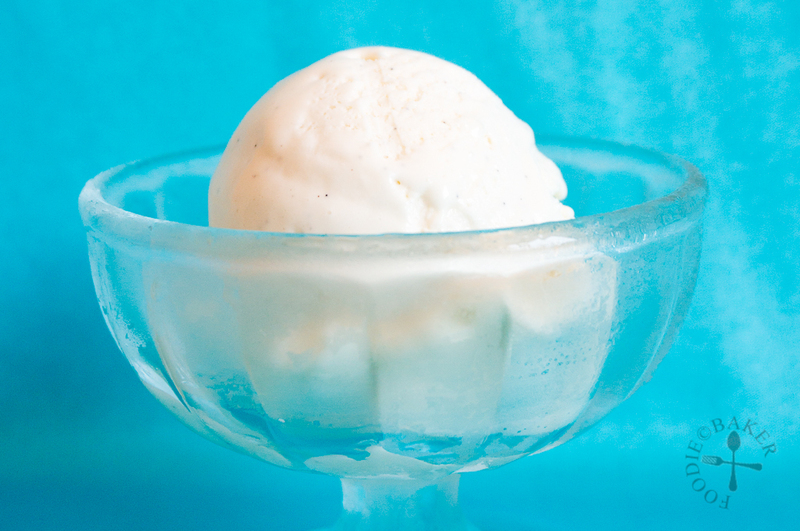 Because I have an extremely easy vanilla ice cream recipe to share today. It doesn’t need an ice cream machine, doesn’t involve the cooking of a custard (i.e. no eggs needed), and uses only 3 ingredients! To be perfectly honest, I was a little sceptical and doubtful when I saw the recipe on Martha Stewart’s website – it seems too good to be true. But I was proven wrong when I had my first “bite” of this ice cream that is made with only cream, condensed milk and vanilla. The ice cream is sweet and extremely rich, with each mouthful bursting with vanilla flavour. Now, why cream and condensed milk (leaving out vanilla as it’s only a flavour) can make such a rich ice cream? First, let’s see what makes an ice cream! 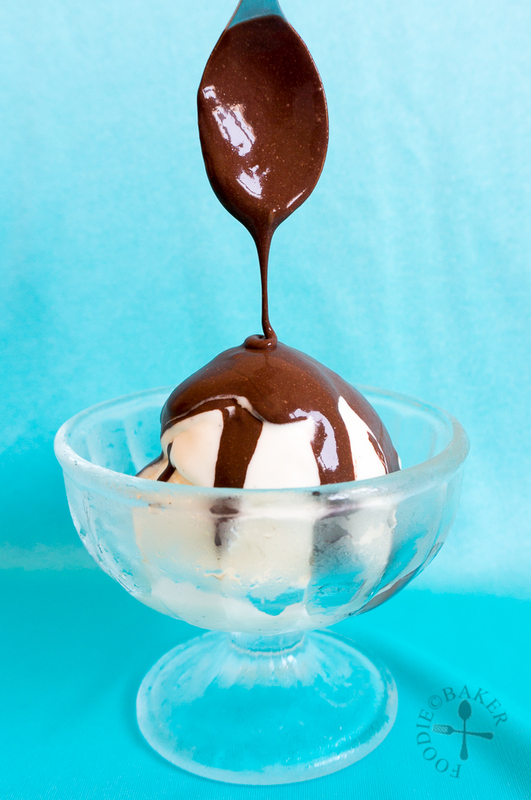 Water, fat and sugar are the important components in ice cream making. Water freezes and form ice crystals, which gives ice cream the solid texture, but you want the ice crystals to be as small as possible so you don’t get a grainy texture in the ice cream. Fat increases the density, smoothness and richness of the texture. Sugar (or any kind of sweetener) lowers the freezing point of the ice cream base, so that the ice cream does not freeze into a rock-solid mass. The churning of an ice cream disperses and break the ice crystals and incorporates air, giving it a smooth and light texture. Cream and condensed milk create an ice cream base that is high in fat, high in sugar and low in water. I guess that is why no churning is required, as there is not much ice crystals in the mix. The fat gives the ice cream a rich texture, and the lack of churning creates a heavy and dense texture, making the ice cream even richer. I think the high sugar and low water content also results in the ice cream to be softer than commercial and regular ice cream, making it immediately scoop-able straight out from the freezer. This also translates to the ice cream melting faster hence it must be served immediately. But I’m not complaining because, seriously, why would you want to wait and not dig into the ice cream immediately? Ok I think I’m getting carried away with the science of ice cream, so let me show you the step-by-step photos and the recipe! 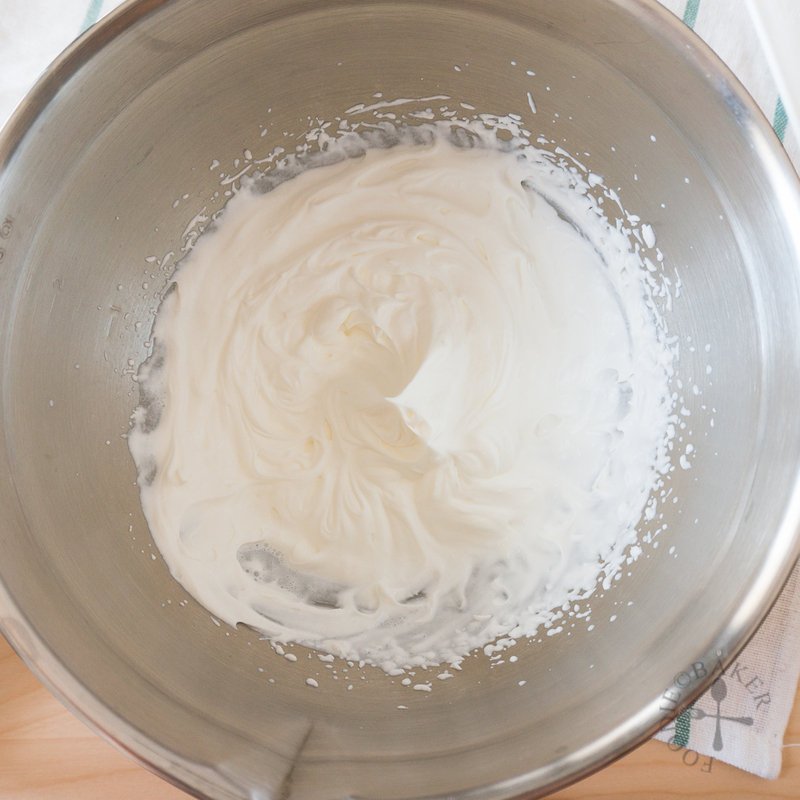 1) Place the cream in a chilled bowl and whip on high speed. 2) Until stiff peaks are formed. 3) Add in condensed milk. 4) And a good dollop of vanilla. 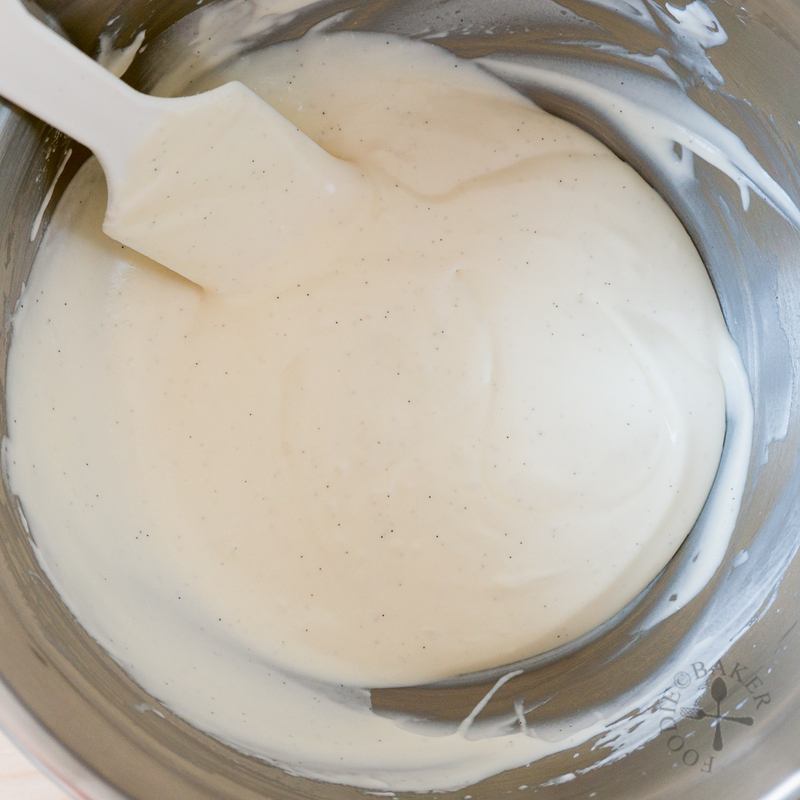 5) Fold the mixture together gently. 6) Transfer to a container and freeze! 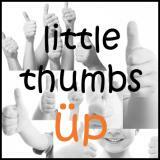 This post is linked to the event, Little Thumbs Up (June 2015: Cream) organised by Bake for Happy Kids and My Little Favourite DIY, and hosted by Diana from the Domestic Goddess Wannabe. This ice cream is soft enough to be scooped straight out from the freezer. 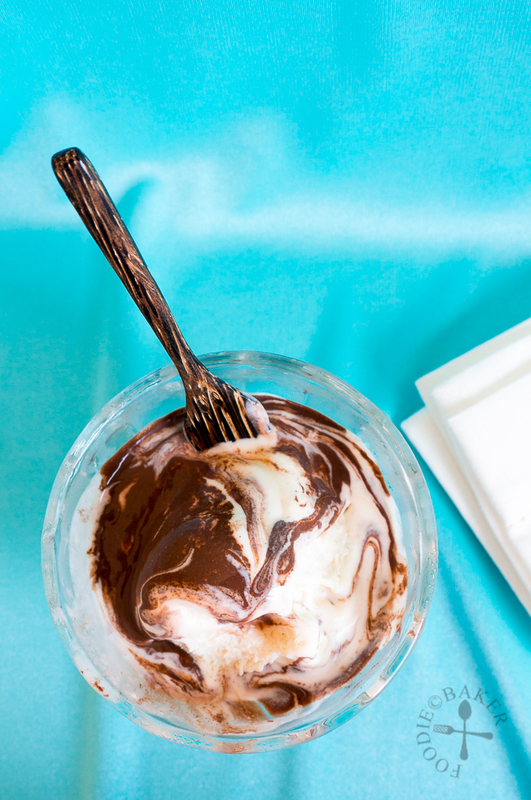 Scoop the ice cream into a frozen bowl and serve immediately as it melts fast. Chill a mixing bowl in the refrigerator for at least 15 minutes. 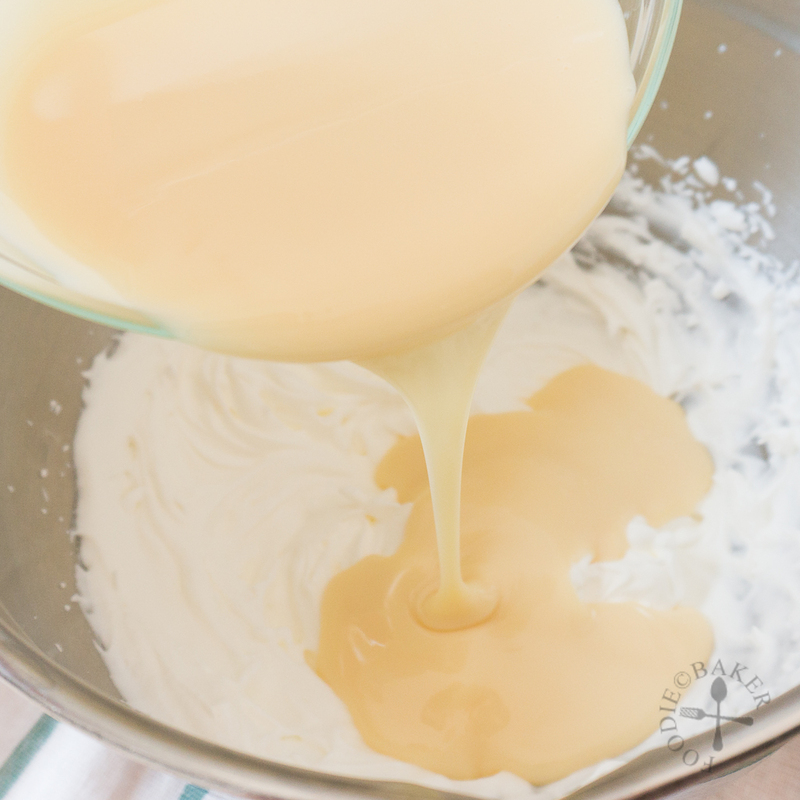 Pour in the cream and using an electric mixer, whip on high speed until stiff peaks are formed, checking every now and then to make sure you don't overwhip. 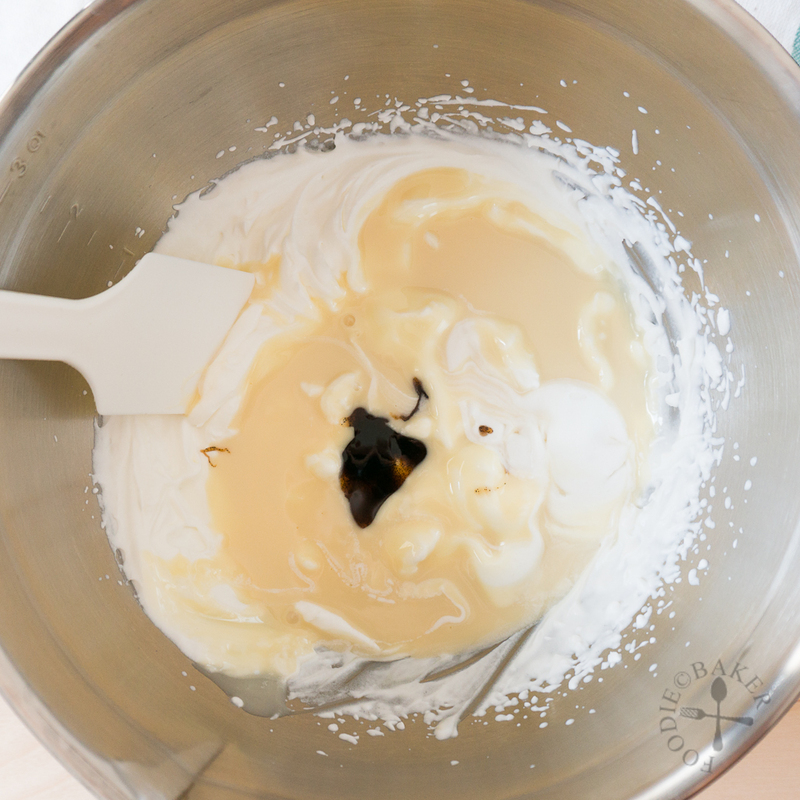 Add in the condensed milk and vanilla paste (or extract) and mix in gently with a spatula. 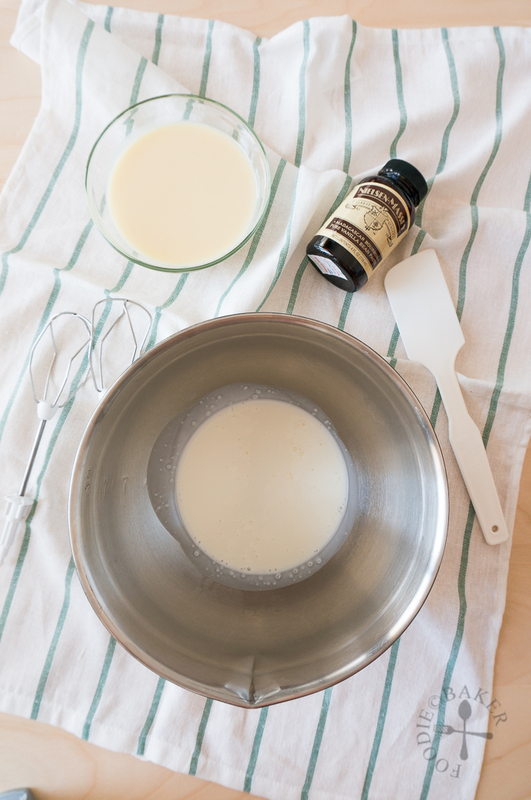 Transfer the mixture into a container and freeze overnight before serving. - In hindsight, this ice cream is pretty sweet, so you can try reducing the condensed milk to 150 grams instead. I will serve it with a very dark chocolate sauce to balance out the sweetness of the ice cream. This ice cream recipe sounds so easy! 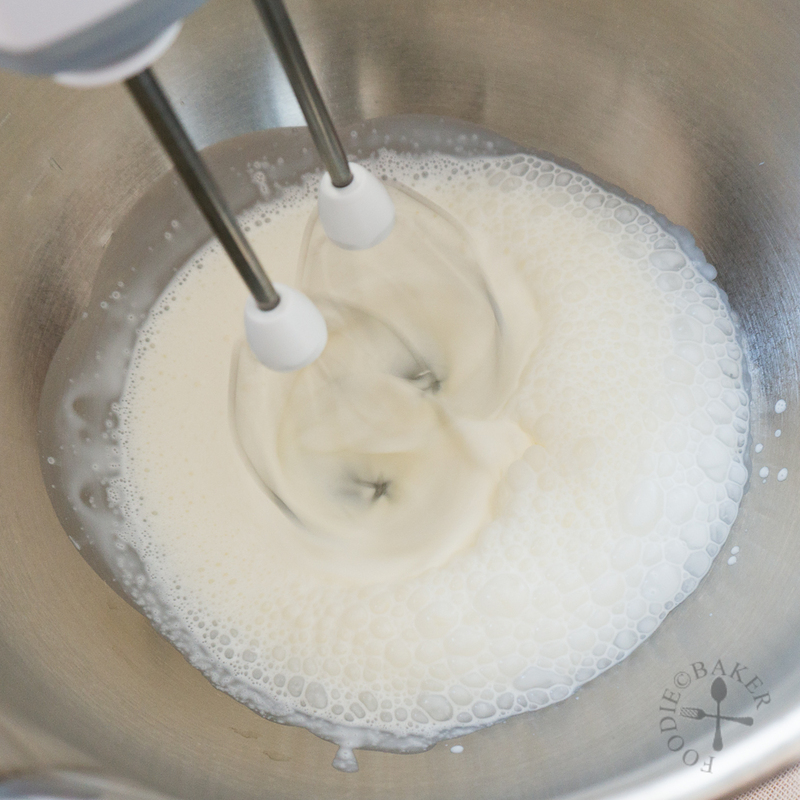 Just 3 ingredients and no churn… Awesome! All I need now is SUMMER!!!! Thanks for sharing with us the science of making ice-cream :-). Very informative, indeed! Honestly speaking, I’ve been looking for a recipe to make ice-cream without an ice-cream machine because I don’t own one! And I think I’ve found the recipe! Thanks, Jasline. You are welcome! I hope you like this recipe! Thanks you! It’s my favourite vanilla paste! I am going to make some vanilla ice-cream tomorrow and i am going to try this. Looks so tempting, only 3 ingredients and no churning needed. It is what i am looking for. Hi Doreen! Yay I hope your boys will love it, it’s sweet and rich! Thanks Maggie! It is a very suitable recipe for the lazy me! VANILLA ICE CREAM is the SHEEZE NEEZE!! Oh Jasline, thanks for the recipe…I have all the ingredients and will try to make your 3 ingredients vanilla ice cream…I can see myself serving this ice cream with fresh berries. Thanks Juliana! A pity berries season are over here 🙁 Otherwise I’d love to serve them with some berries too! aww I love this Jasline.always I love Ice cream, all seasons! I have to try this look beautiful! Thanks Gloria! Hope you will like it as much as I do! i am so intrigued by this! i just finished making a coconut-milk based vanilla ice cream and it was okay but i think maybe i didn’t churn it properly because it came out frozen rock solid, not soft like ice cream is supposed to be. so anything without churning sounds pretty good to me right now! Thanks Anna! Coconut-milk based ice cream sounds really yummy! I wonder if I substitute the cream with coconut cream will I get the same result… itching to try but I’ll have to finish this ice cream first! Durian!!! Oh my I really miss durian, I don’t think I’ll be able to find it here, I want some of your durian ice cream too, save some for me! This is my favorite way to make ice cream, Jasline! So much better than getting a giant machine to take up space in the kitchen. Looks perfect! Hi Lena! Yes I was craving for ice cream but my ice cream machine was spoilt. 🙁 But luckily I found this recipe! If it’s not too much of a trouble, can I check which browser and version you are using? So I can try to recreate the problem. Thank you! Thanks so much for posting this. I always hesitate to make ice cream even though I have everything I need. This actually makes me want to make it! You are welcome Dave! Can’t wait to see some of your ice cream! Wow, no churn but the ice cream still looks amazingly rich! Gosh, I have all these ingredients on hand. If I can get some local berries, this will be on my list to make this week! Well done!!! Thanks Liz! Oooh berries sound like a delicious addition, can’t wait to see your ice cream!